Should it be tai chi chuan or tai chi? We're often asked about the difference between the two. At the risk of being seen as trying to avoid the question we'd just like to say that this is a subject that gets people's dander up. For some, the difference is that tai chi chuan is the fighting art with practical attack and defence applications and tai chi is what people do for health and relaxation with no fighting applications. We've actually heard some instructors never mention that it is a martial art for fear of putting people off. For others, tai chi is the fighting art and everything else is a pale imitation - nothing else is the real deal. Nasty.. As we said, this can bring up really strong views..
On this site we will only use tai chi chuan when we talk about the martial art and the general history of taji ( an alternative spelling!). 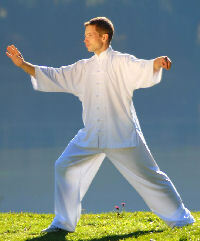 When we use tai chi we are talking about the tai chi forms practised for health and relaxation and the qigong exercise. We often refer to some qigong exercises as tai chi exercises because so few teachers make the distinction between qigong and tai chi that many of our visitors would bypass the qigong section altogether on the basis that they don't do it. We know - not a real help - but then again hundreds of years old, millions of people practicing the art across every continent in the world - its difficult to imagine 100% consistency. And remember tai chi is often about going with the flow. We say don't fret it.